Sporting Schools is all about fostering a lifelong interest in sport among Australian children. By building the relationship between schools and sports, Sporting Schools will see more children take part in sport based activities - and develop healthy habits to last a lifetime. Schools, coaches and sporting organisations across Australia can join the programme via the Sporting Schools website. Why offer orienteering at my school? Orienteering is part treasure hunt, part amazing race. Students use a specially prepared map to navigate their way to a number of checkpoints. They go at their own pace, usually on their own but sometimes in pairs or small groups. Everyone is part of the action, no one is left 'on the bench'. Often called "The Thought Sport", orienteering appeals to a wide range of students, not just the 'sporty types'. Orienteering is both a sport and a recreational activity enjoyed by people from age 5 to 95. It is the ideal family sport. Participants are of all fitness levels as they can walk, jog or run around their course. Orienteering can be done in schools, parks, around the streets or in the bush. Students who learn orienteering at school are offered a sport for life! The map will cost from $250 - $800 depending on the complexity of your school. The average cost is $400 excl GST. Orienteering Qld has grants of $200 - $400 are available to help with the cost of your map. Please contact sportingschools@oq.asn.au for more information on mapping your school. 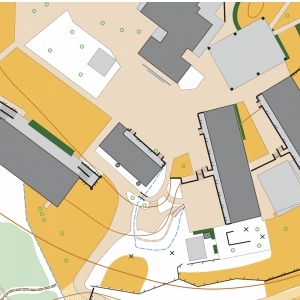 This is an extract from a typical orienteering map of a school. Notice the detail of all the features. Maps are usually between 1:1000 to 1:4000 in scale and special attention is given to buildings (dark grey), undercover areas (light grey), man made features like bins and chairs (black x) and distinct trees (green circles). Orienteering maps always show magnetic north, however using a compass is a more advanced topic that isn't covered in the sporting schools program - instead, it's preferred that the map is oriented according to the features you can see. Option 1: A teacher from your school attends a Level 0 Coaching Course. Level 0 courses are run several times a year. It is a 4 hour course which costs $66 (incl GST), including pdf copy of "Orienteering Games" and a hard copy of 'Elementary Orienteering Instructor's Handbook' which will give you the skills and confidence to run orienteering sessions in your school. Contact sportingschools@oq.asn.au for more information on Coaching Accreditation. Option 2: Orienteering Qld provides a coach. Contact us with your location and preferred time slot and we will endeavour to provide a coach for your school. While we will do our best to fulfil your request, it is not possible for us to service all areas of Queensland. Please email sportingschools@oq.asn.au with your request. 3. You will need equipment. Orienteering Qld has an excellent teacher resource, "Orienteering Games". This book can be purchased as either a hard copy or an electronic version. The electronic version is included in the Level 0 Coaching course. This book covers all year levels from Prep to Year 10 and includes lesson plans with complete lists of all equipment/materials required. There is also an excellent free resource, "Games Orienteers Play", which contains lesson plans for Prep to Yr 12. The units consist of sequential activities which teach orienteering skills (eg. orientating the map, compass points, map symbols, control punching, distance estimation, international control descriptions and contours) and orienteering courses (cross country, star relay, loop, scatter, and route choice) which can be set on your school map. (This is covered in the Level 0 coaching course). All prices inclusive of GST. Postage costs on enquiry. Courses set on your school map (as described in the Unit Plans) (A Level 0 course will teach you how to do this yourself). To order, simply email sportingschools@oq.asn.au with your requirements.